The Wooden House Nursery School is open to all children from the age of two to statutory school age, without discrimination. Prospective parents are invited to make an appointment to visit us with their child. Your child’s name can be placed on the waiting list by returning a deposit if applicable and the application form found on our website. Once your child is offered a place and the start date is confirmed then a free 2 hour ‘taster session’ will be arranged between the class teacher and family. This is generally the first session of the term the child is due to attend the setting. Following your initial visit to the setting the class teacher will invite your child to a free ‘taster’ session. This date is agreed between the setting and family and is a shorter two hour session and enables exchange of information before and after the morning. For the ‘taster’ session parents and carers may wish to stay with their child or they may choose to leave their child for this initial session or part of the session. The nursery is flexible and will adjust to meet each individual’s needs. We do ask that a parent is contactable and available should they decide to leave their child in order that we can communicate with them if necessary. During the ‘taster’ session should you wish to receive a telephone call relating to your child’s settling in please do not hesitate to ask and we will ensure this happens. We are open from 8.00am – 6.00pm Monday to Friday, 51 weeks per year. (We close at 12.00 noon on Christmas Eve and are closed on Bank Holidays and during Christmas week). For children attending term-time only, fees are paid half-termly in advance and are not refunded due to sickness or holiday. Children attending full-time will be invoiced monthly in advance with a 4 week holiday allowance charged at ½ rate if required. 10% discount will be given to a 2nd sibling attending at the same time, but only if they are not in receipt of government funding. This discount is only applied to any hours remaining after the deduction of government funded hours to the older sibling. For children arriving by 8.15am, breakfast will be available, upon request which is free of charge. A full day (8.00am – 6.00pm) includes a light tea for children booked to attend after 5.00 pm, but this may be served earlier. From Monday 29th October teas will be bookable in advance and charged at £2.50 per meal, they will be served at 4.30 pm and any child attending the Nursery at this time is eligible. All hours after voucher hours have been used are charged at £5.00 per hour. All bills should be be paid within two weeks of the issue date or a 10% surcharge with a minimum fee of £10.00 will be incurred . When is your child eligible for free Government funding? 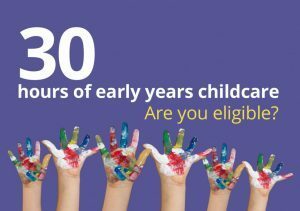 All 3 and 4-year-olds in England can get 570 hours of free early education or childcare over 38 weeks of the year (or fewer hours over more weeks).